We have a gorgeous easy recipe just in time for Valentine’s Day! 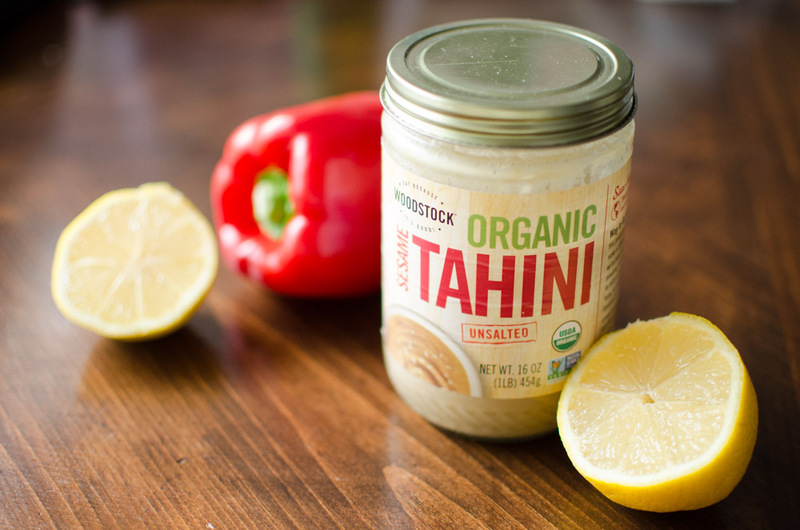 Our kids love hummus so we’re excited to see how to make it at home! Welcome, Oh So Delicioso! 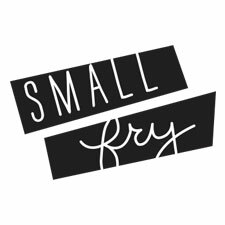 “Hi Small Fry readers! Aubrey here from Oh So Delicioso. We are a cooking lifestyle blog sharing recipes, cooking tips, holiday fun and generally foodie love. Yet somehow one of our love/hate relationships with holidays is the food…baked goods, sweet treats and sugary drink! So good right?! But oh my, so not healthy. We are all about having a happy medium with food. Enjoying a sweet treat here and there is nice, but there has to be a balance. We have a healthy yet festive Valentine’s option for you today. 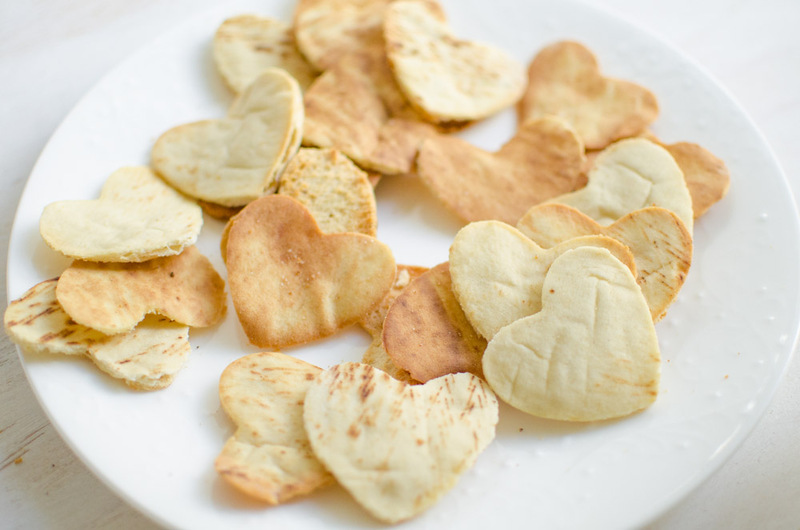 Switch out those heart suckers for some heart pita chips dipped in Roasted Red Pepper Hummus! With a mild tang and smoky smooth flavor, the whole family will fall in love. We are big hummus fans over here. 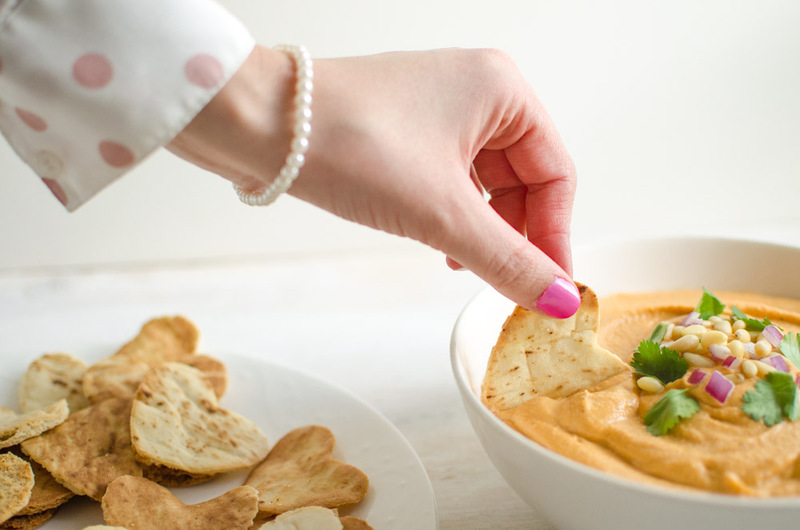 From Pesto Hummus, Layered Greek Hummus, to Traditional Hummus, we love it all. If you haven’t tried hummus before, don’t be afraid. It’s basically a bean dip with some sass. Typically made from garbanzo beans or chickpeas (the same thing, two names), but you can also sub Great Northern White Beans and just use slightly less water. So really it is a bean dip. Just try it already. And get your kids to eat it! Incredibly healthy and loaded with protein! If you are going low-carb style then skip the pita bread and load up your veggies. Roast your red bell pepper either under a broiler or over an open flame gas stove. When skin is blackened, allow pepper to cool in a paper bag. Remove from bag and peel off majority of black areas. (It’s ok if some remains, it will add to the smoky flavor.) Remove stem and seeds, if you haven’t already. In a large blender or food processor place all ingredients. Pulse until smooth. Add more salt or lemon juice to taste. It’s totally normal if you have to scrape the sides and pulse it a few extra times for an extra smooth hummus. Pour into a bowl and garnish as desired. 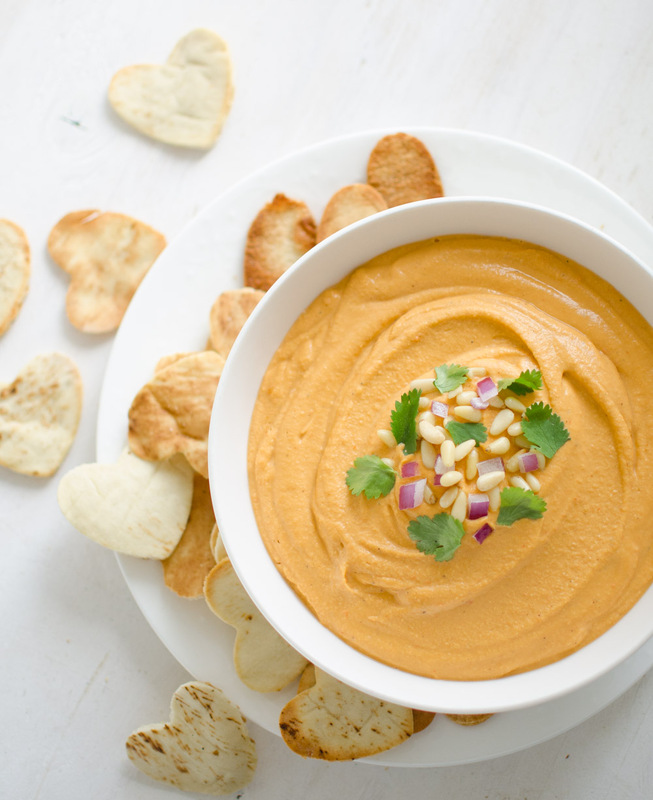 Serve with pita chips, pita bread, or vegetables for dipping. Store refrigerated. Break pita bread in half, then separate by opening up the bread into a pocket. You should have 4 pieces. With a small heart shaped cookie cutter, press firmly into each side cutting out hearts. Line a baking tray with foil, and align the hearts. Brush each side with the oil and sprinkle with a little garlic salt. Bake at 350 degrees F for 8-10 minutes or until golden brown. Serve with Hummus. Share with loved ones and enjoy your healthy Valentines! Follow along with Oh So Delicioso via Instagram // Facebook // Twitter // Pinterest. Browsing not recommended when you’re hungry, you’ve been warned. Hummus is a favorite snack of mine, I will definitely have to try this out! cute and tasty….it’s a win win! I personally love regular hummus over various flavors, but this was way way better than I imagined. loved it! Its not my favorite.